Description Re-datum and shift velocity models. This process updates a velocity model with new starting times. It can be used to safely re-datum and shift velocity models. Scroll to the bottom or type to search, and double-click Velocity Re-Datum. In the Details Panel, at Velocity Volume, select the velocity volume to be used in the process. The velocity model must start at TWT=0 or TVD=0. At Velocity Type and Units, select from the drop-down list the type of velocity and units assigned to the velocity. 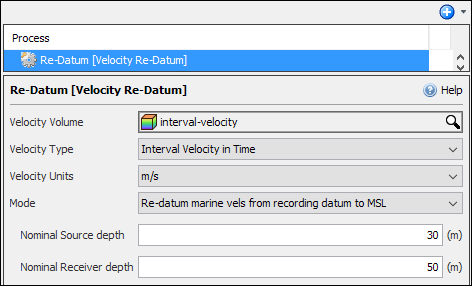 At Mode, select to use a User-defined TWT shift or to Re-datum marine vels from recording datum to MSL. 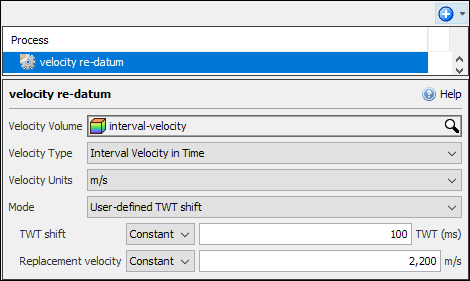 TWT shift is the shift in two-way time required to re-datum the velocity model. Select from the drop-down list to either use a Horizon or a Constant. If a horizon is chosen, you can optionally input a constant to offset the horizon. The Replacement velocity is only used when the TWT shift is positive (i.e. deeper). Select from the drop-down list to either use a Horizon or a Constant. If a horizon is chosen, you can optionally input a constant to offset the horizon. 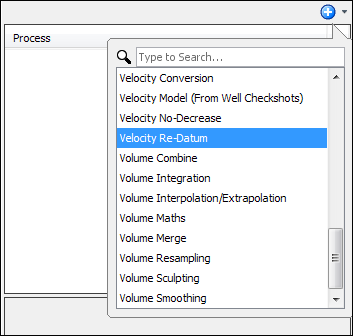 As a result of this process, a new velocity volume is available in the Volume tab. This mode is typically used to re-datum picked NMO velocities at recording datum to MSL for use in migration. In this mode the user is required to enter two parameters, Nominal Source Depth and Nominal Receiver Depth. The nominal source and receiver depths (along with a water velocity value) are used to calculate the required time shift for re-datuming. The water velocity for each trace is taken from the first sample of the input velocity model. This velocity value is also used as the replacement velocity in this mode. Insight converts the input velocity to ZT (depth values sampled in time), if necessary. If the input velocity is in depth, then Insight uses the same DT, but swaps m for ms. The smallest and largest shift in the entire TWT shift horizon will be determined. Shifts of more than +/-500ms will give you a warning; more than +/-1000ms will be an error. If the original velocity is sampled in TWT, then the output trace length = the original trace length + largest shift rounded up to the next sample. Note: This still holds even if the largest shift is negative. If the original velocity is sampled in depth, then the output trace length = the original trace length + max(largest shift, 0) * replacement velocity / 2000 rounded up to the next sample (/2000 because we are starting with TWT, not OWT). This means that if all shifts are negative, then Insight output traces of the same length as they come in. If there are any positive shifts, then Insight calculates the additional length from the replacement velocity. – if the input trace is 0-9000ms and the largest shift is 150, the output trace is 0-9150ms (rounded up if necessary). – if the input trace is 0-9000ms and the largest shift is -50, the output trace is 0-8950ms (rounded up if necessary). – if the input traces is 0-5000m, the replacement velocity is 1900m/s, and the largest shift is 150, the output trace is 0-5142m (rounded up if necessary). reads the input ZT trace. shifts the trace (by simply adjusting the TWT axis) by the appropriate amount at that location. rv is the replacement velocity in m/s. if the final sample is < the length of the output trace, Insight extrapolates the final interval velocity down to the end of the output trace. Insight then converts/resamples back to the original velocity type, chopping the top off at 0ms or 0m.